Early this afternoon I was in my Barkerville dressing room hunting for some fingerless gloves. The day had turned unexpectedly warm and I needed to shed my regular, now uncomfortable gloves and swap them for a cooler pair. As I was banging about in my costume drawers there was a knock at the door. I opened it to find my husband, James. At first I was happy for this unexpected visit, but then I saw his face, and I knew. For the past week and a half we have been painfully aware that what had happened was a possibility, but somehow we couldn’t imagine that it would ever be reality. Today we learned that our Wells-Barkerville community lost one of the brightest stars we have known. Thirteen years ago Tim Sutherland came into the Barkerville fold as next in a line of truly fine actors to tackle the formidable role of Judge Matthew Baillie Begbie. My husband, James Douglas, had already known Tim for years, and in 2002 managed to convince the renowned actor, director and historian to come up to Williams Creek and accept the challenge of playing the iconic, and infamous, “Hanging Judge.” James understood that the man who plays Begbie must be well-seasoned, versatile, quick-witted and fiercely intelligent. Tim Sutherland was all of that and more. Tim promised us one season… but, as was the case with so many before him, Barkerville and Wells captured him and one season led to another and another and another. He loved the site, the history, the community. He loved it here so much, in fact, that a few years ago he opted to make Wells his permanent home. He kept an apartment here, even when his professional and academic commitments kept him elsewhere for most of the rest of the year. Tim graced the Cariboo with his excellent interpretation of colonial law and early justice, and he spent hours upon hours of his life joyfully creating theatre in the evenings and on his days off. He wrote material for and collaborated on the creation and performances of the popular Sunset Cabaret, he produced and directed plays here and abroad, and was constantly organizing readings of new, as-yet-unproduced work. Recently Tim returned to university to pursue a second graduate degree in theatre. When he wasn’t making art, he was talking about it. He ate, drank and breathed theatre. He loved everything about it, and it showed. This season was the happiest I have ever seen Tim. He was deeply in love. He directed the world premiere of a new play by an up-and-coming playwright from the National Theatre School, Godhead, which is currently running in rep at the Sunset Theatre in Wells. He loved presenting the Early Justice School Program in Barkerville, which he and his fellow interpreters had polished into a virtuoso piece of interactive museum performance. He was just about to return to Alberta to defend his Master’s thesis. He was, as we say, living the dream. When Tim fell ill ten days ago our Wells-Barkerville community rallied. If it was possible for love, respect and affection to heal a person, Tim would still be here. We all wished and hoped as hard as we ever had. But we could not save him. It is impossible to think how we will get through the heartache of walking into the Wells Hotel pub and not seeing Tim there, on a barstool, holding court. How will we ever walk to Richfield, or see a play at the Sunset Theatre, or pop into the House Hotel after work, without bursting into tears in the face of the gaping hole this man has left in our lives? Today we are an open wound. But tomorrow things will feel a little better. Gradually, we will learn to adjust to this new world without Tim in it. And, eventually, we will find that place of gratitude; that place which helps us understand how rich we are for having known him, and loved him. Our Tim. 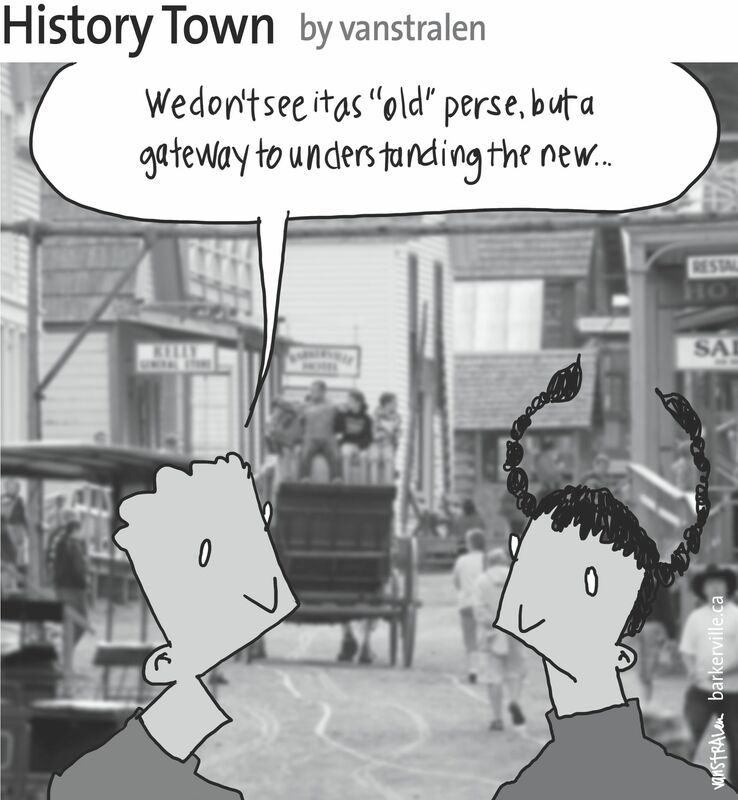 The above one-panel cartoon (originally published August 1, 2015) by Dirk Van Stralen, with accompanying editorial by Danette Boucher, is the ninth of twenty weekly entries that were logged – and subsequently blogged – as part of a 2015 collaboration between Barkerville, British Columbia and the Prince George Citizen aimed at introducing some of the realities of living, working, and playing in the Cariboo Goldfields. Thank you for reading.